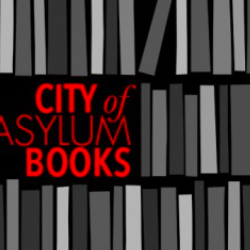 The annual meetings of organizations like the International Cities of Refugees Network (ICORN), the PEN’s Writers in Prison Committees (WiPC), and the literary centers’ network in Europe, Halma, took place in Brussels from March 24 to March 27 as part of the biannual Passa Porta Literary Festival in Brussels. While each organization attended their own workshops, they participated in common conferences and a collective opening event. 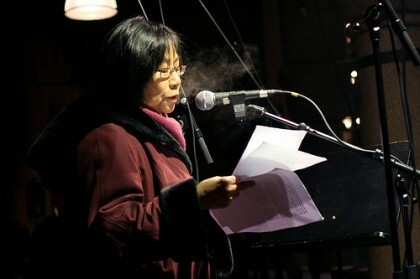 One of the speakers at the opening event was the Independent Chinese PEN Center President, Tienchi Martin-Liao. Read the speech in its entirety in this Sampsonia Way exclusive. IS JASMINE A CHINESE FLOWER? There are tens of thousands of large-scale demonstrations in China each year. People protest against poisonous baby food, environmental destruction, illegal land seizure, forced relocation, or any number of things. Yet these protests have never gathered into a movement and swept through the whole country, not to mention crossed the border like the Jasmine Revolution in Tunisia and the series of protests currently taking place throughout the Middle East and North of Africa. The Chinese government’s campaign against the intellectuals has only become more severe after dissident Liu Xiaobo received the 2010 Nobel Peace Prize. In this speech, I will try to explain the origins of the protest movement and give an update on the human rights situation in China. Since last December’s uprising in Tunisia—the so-called Jasmine Revolution—similar protests have taken place all over the Arab world including Bahrain, Yemen, Iran, Morocco, Algeria, and Iraq. The ripples have even been felt in places like Albania, Kazakhstan, and China. These protests resulted in Egyptian president Hosni Mubarak’s resignation on February 11 after 18 days of seesawing. Now it looks as if Libyan leader Muammar Gaddafi maybe be the next dictator to fall since the West has become involved in the country’s unrest. As we know, the use of communication technologies, the Internet in particular, has contributed greatly to the mobilization of protests. Online media such as Twitter, blogs, and Facebook have been widely used to spread information and organize movements. The upheaval in the Middle East and the north of Africa have affected China immediately and immensely. The first call for a Jasmine Revolution in China came on February 20. An anonymous posting appeared on the Internet asking people in large cities to take a walk downtown every Sunday at 2 pm. Since there are over 450 million Internet users in China, this announcement spread like wildfire. People used emails, Facebook, Twitter and blogs to inform others. Now every Sunday afternoon people gather in the downtowns of Chinese cities. Their slogan: “no guns, no cannons, only be there each week at the same time. No shouts, no riots, just give the plainclothes police your smile.” So far, there have been 5 instances of this “smile and walk revolution” in China. Every Sunday afternoon, there are also hundreds of thousands of policemen in China’s downtowns; they check IDs and photograph and film everything. The authorities have also arrested a number of human rights activists, writers, and lawyers preemptively. For instance, Independent Chinese PEN Center (ICPC) member and lawyer Teng Biao was arrested on February 19. Our webmaster Ye Du was arrested on February 22, even though he has nothing to do with the Jasmine Revolution. Several other members of ICPC including Jiang Danwen in Shanghai and Liu Di in Beijing were arrested and detained for an entire Sunday. In the last four weeks, over 30 writers, lawyers, and other ICPC members have been arrested and detained. Another inhuman and illegal method employed by Chinese authorities is kin liability or ‘Sippenhaft’. In other words, when they arrest someone, they simultaneously place a family member under house arrest. A recent example is the house arrest of Liu Xia, Liu Xiaobo’s wife, who was placed under house arrest after her husband won the Nobel Peace Prize. Her home is now a prison. She is not allowed to leave the house, or communicate with friends or family members. They cut off her phone and Internet. The security police do her grocery shopping. The same is also true for Mr. Ye Du’s and Mr. TangJingling’s wives. Liu Xiaobo was awarded the 2010 Nobel Peace Prize during his 4th prison term. 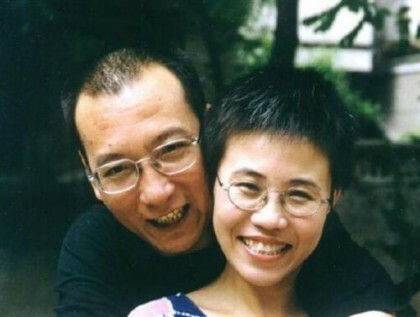 His wife, Liu Xia, was placed under house arrest after his recognition. The first mass demonstration in China happened in 1976, after the death of beloved premier Zhou Enlai. Thousands of people spontaneously gathered in Tiananmen Square to mourn, placing wreaths, flowers, and poems on the square. The government removed all of the commemorative items and banned gathering there. The following day tens of tens of thousands of people protested. CCP leaders authorized the use of force to clear the square. Today we still do not know how many people died in that incident. Zulfikar Ali Bhuto, the former president of Pakistan, estimates some 4000 people died. Thirteen years later was the Tiananmen Square massacre of June 4. We all know the tragic ending of that peaceful protest movement. Over the last 10 years, we know there have been more than a hundred thousand large-scale protests and demonstrations annually. The reasons for these mass protests are seldom political; the demonstrations are the result of conflicts between the common people and authorities. The crowds of protestors include angry citizens who have been forcibly relocated with very low compensation or peasants whose land is unfairly expropriated. Sometimes the cause could be a smaller incident, for example a pedestrian who has been hit by the car of an official and has been treated unfairly by the police handling the case, or an unjust trial. In the past year, however there has been an increase in the number of people getting involved in mass protest actions that are unrelated to personal gain or profit. In other words, they want justice for everyone and not only for themselves. This is the spirit of the present Jasmine Revolution in China. People do not protest because of inflation or for better salaries. Instead they want change. They want freedom of expression and freedom from fear. 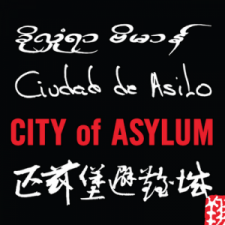 As Liu Xiaobo predicted years ago, that civil awakening is the hope of a free China. What chance does this mass movement have of success? There are a hundred reasons the revolution will succeed, and there are a hundred reasons why the government will prevail. I want to mention just two reasons of each outcome. 1. There is a civil awakening among the common people. Today, the Chinese are no longer the obedient subjects that they were in the Mao era. They know about basic human rights, and are willing to fight to protect their own interests and rights. This was apparent in Taishi village in 2005 when residents petitioned and protested for the removal of the village chief, and in 2009 when thousands protested and petitioned online for the release of Deng Yujiao, a pedicure worker as charged with homicide after stabbing an official who attempted to sexually assault her. (She was subsequently released.) Both of these cases show us that people are not only willing to fight for their own rights, but also they care about the fate of the victims of bureaucratic abuse and violent policemen. 2. The wide use of the Internet and other technology. Using cell phones, people can broadcast short messages. Now everyone can be a self-made journalist. Eyewitness reports on protests, gatherings, and conflicts can spread like wildfire. Censorship has lost its effect. Through cell phones, people can access Twitter, which is not controlled by the authorities because the providers are outside China. The effect of Twitter news dissemination is incredible. Within minutes, information has crossed the border and out of the control of the authorities. People don’t trust government news and prefer rumors and unconfirmed news and reports. Electronic devices will play a decisive role in the change of China’s fate. 1. A large number of the common people enjoy an acceptable standard of living. They know that the administration is corrupt and abusive; they know that there is no rule of law and the authority controls the media and spreads lies the most time. However, they don’t want to lose their comfortable life, especially the older generation who have been scarred by the memory of the cruel Cultural Revolution. The brainwashing with patriotism and nationalism has imprinted itself on their thinking. “China should be large and strong.” “Only under the leadership of CCP, China can have stability and prosperity.” These mottos have been accepted by the overwhelming part of the population. 2. The CCP has divided the country into 7 military zones. Each zone has a specific mission. The militaries are very well compensated both monetarily and with prestige. Therefore they are loyal to their patron, the CCP. In Tunisia, Egypt, and Eastern Europe, the military remained neutral and did not play the role of killing machines for party. This will not be the case in China. We know this from the Tiananmen Square Massacre of 1989. Power is a very unpredictable thing. The government in Beijing is rich and strong, and controls the army, the resources, and the media. It is difficult to make any prognosis about CCP and China’s future. Yet one thing is clear to me: to fight for the freedom of expression is the mission of our PEN family. I am convinced that with each gained niche of space for freedom of expression in China, we are an inch closer to a free and democratic country.